New Video Unboxing for the Influenster #FrostyVoxbox! Selena Thinking Out Loud With Purpose has a new video unboxing for the Influenster #FrostyVoxbox. All of the products shown in the video were provided by Influenster for testing purposes. Learn more about Influenster. It's the perfect time of year to learn about new teas, lip colors, eye liners, sweet treats and more, and they all came inside of the Frosty Voxbox. Take a look! Do you use any of the products mentioned in my Influenster Unboxing? If so,which are they? This Giveaway Has Ended. See Who Won on the Rafflecopter Form Below! Selena Thinking Out Loud With Purpose is happy to bring all of its readers this 2015 Create Your Shining Year Workbook Giveaway! In January 2014, I was introduced to this very book, in a random email, and I took action to learn more about how it could help turn my goals into action steps to achieve more results in my Life + Business. In the end, it helped me to achieve massive results in my finances, my online business, and in my life. I have always heard about writing down your goals, but actually seeing them manifest anything, was another story. Now, that I have seen how this simple, fun, interactive, workbook, helped me to manifest my goals, I have purchased the 2015 version (shown below). It is available for purchase in an ebook (eWorkbook) version, where you can type directly on the pages and save it to your computer, IPad, etc., or in a Hardcopy version with a hardcopy wall planner. Both options are available HERE for purchase. If you would like to try to be one of my two (2) lucky winners, you can enter the giveaway below! Good Luck! Two (2) lucky winners will receive a copy of Leonie Dawson's 2015 Create Your Shining Year Workbook and Planner. Rules to Enter: You must complete the actions on the Rafflecopter below to enter this giveaway event. Open Worldwide. International winners will receive the eWorkbook version if they are outside of Australia, Canada, United Kingdom, or United States. US residents have an option of either version, as described. Disclaimer: Selena Thinking Out Loud With Purpose will contact the winners via email for their mailing or email address to send the prize. Leonie Dawson and any social media sites mentioned in this giveaway are connected to this giveaway. This blog is an affiliate of Leonie Dawson's Create Your Shining Year Workbook and Planner. Merry Christmas and #Christmas Cards I Received for 2014 (Video Inside)!! I hope you're having an amazing day with your family and friends. Did you get the gifts that you wanted? I was so blessed and fortunate to receive holiday Christmas cards. I put them up all over my home to get into the holiday spirit. Do you still get Christmas cards too? I know that many people like to send out e-cards by email or on social media. In this video, I shared all of the very special Christmas Cards I received this year! Have an amazing Christmas Day!! Share Your Comments Below Do you still enjoy giving and receiving holiday cards? This BzzAgent Unboxing and Review shares 100% of my personal opinion and experiences using this product, which was provided for free to Bzzagents. Selena Thinking Out Loud With Purpose was invited to another BzzAgent campaign and this time I had the opportunity to try a new 'Secret' deodorant brand called OUTLAST. Wow! That's what I said to myself when I first read the front of this Secret deodorant bottle. 48 hours! That's a long time for a deodorant to work. It also talked about leaving no white mark residue, which is also VERY important, so I was definitely curious to try it out. I tried the Secret Clear Gel OUTLAST deodorant with the Completely Clean scent. It had a pleasant smell when I popped open the top and the solid was indeed clear gel. After taking a shower, I applied the deodorant and could feel it creating a barrier in my armpits. It felt like my armpits were being sealed to avoid any moisture, but it wasn't sticky or anything but I could feel the barrier of protection. I had SO many things to get done, from boxing items for shipment, to yoga class, to working on editing tasks, etc, so this solid really worked when I felt myself getting anxious. I found myself checking my armpits throughout the day, after yoga class, etc, and it was still working, while I was lifting, sealing, and labeling boxes to mail. I also never noticed any white streaks on my camisoles or blouses so that's a plus. I have used other brands of Secret in the past, so they already had a great track record with me, but I really like this deodorant. Sometimes, with other solids, I do have to reapply deodorant or sometimes wonder if I even applied any because I don't notice it there or working at all. So, I can say that it does it's job and since I did work like I was running a 48 hour marathon, I would have to say that this solid does work well under pressure. It did keep me well-protected and with my busy schedule, moving around this town, it stood up to my schedule. P.S: Did you enjoy this BzzAgent Unboxing & Product Review for Secret Clear Gel Outlast deodorant? If so, make sure to share it using the social media buttons below! Thanks for stopping by! Selena Thinking Out Loud With Purpose invites you to share in my Princess Cruise excursion experience to L. A. Cetto winery in Ensenada, Mexico. This particular excursion provided a nice educational tour and a wine tasting at the end to sum it all up. We were also given a bottle of wine to take home and share with our friends, family, and the loved ones. It was a 4 hour excursion, total, with a 50 minute drive both ways from the Ensenada, Mexico port to the L. A. Cetto winery. It was scenic but also entertaining with our tour guide, Roger. In this video below, I captured my entire experience during this excursion to give you some idea of how wine is made and enjoyed by many people all over the world. Enjoy! Learn more about the many Princess Cruises and plan your next big adventure too. Selena Thinking Out Loud With Purpose would like to introduce you to a great site for getting cash back, promo codes, and coupons, to save money on your online shopping. I just found out about Ebates and they even sent me a little extra gift for using them to save money on my recent online shopping purchase. The holidays, Black Friday, and Cyber Monday, will be here before we know it. Make sure that you are getting all of the cash back opportunities that you can this year. Why give all of your money away when there is an opportunity with Ebates to keep some of it in your pocket. Give them a try and see what you think! To use them, it's absolutely free and they actually pay you each month...see my product review, in this video below. Get Started with Ebates Here! Leave A Comment Below To... Do you use cash back rewards sites to save money on your online shopping? P.S: Did you enjoy this blog post on how to get cash back, promo codes, and coupons using Ebates for you online shopping? If so, make sure to share it with your social media family and friends, using the button below this post. Thanks!! Disclaimer: Selena Thinking Out Loud With Purpose was not contacted by Ebates to do this product review. These are 100% my own opinion after using them for my personal online shopping needs. This post uses the tell-a-friend link to share the online cash back site for Ebates. Selena Thinking Out Loud With Purpose is happy to invite you to enter this First Things First Moonpie Giveaway, spotlighting the importance of strengthening the family and spending more time with them. The summer is coming to a close, but even as we soon approach the holiday rush, we will celebrate even more good times with the ones we love. This also allows time for husbands and wives to connect even more with each other, away from the daily work and children responsibilities. In this short clip below, First Things First - Date Your Spouse, it shares how dating after marriage, connecting, and the simple touch with your spouse, creates a newness in you both. This also expands into other parts of your life throughout the year. The summer may be coming to a close real soon, but how about surprising your wife or husband with a last minute get-away, a picnic, a walk in the park with flowers, or a hike and candlelit dinner? You have lots of great ideas floating around in that head of yours, so let's see what you've got. Here are more First Things First Videos to Watch! 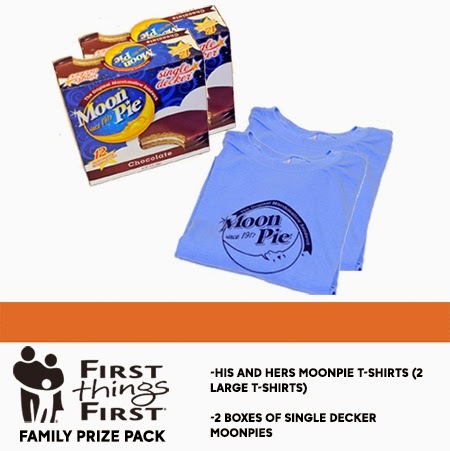 All Entrants Please Note: Each household is only eligible to win One (1) First Things First Moon Pie Prize Pack via blog reviews and giveaways. Only one (1) entrant per mailing address per giveaway. If you have won the same prize on another blog, you will not be eligible to win it again. Winner is subject to eligibility verification. Disclaimer: The prize will be sent via FedEx or USPS. No P.O. Boxes please. Please note that the assets included within this message were delivered to you to promote First Things First. Any actions (including contest and competitions) that you complete with the provided assets are your liability, and should comply with both local and international laws. Also, please remember to disclose that you are working with First Things First, or that First Things First supplied these materials to you if required by local law. I have 2 cat-roomies, living with me. My 4 year old cat, Sonia and my 14 year old, Theodore (Theo for short). I have to watch Theo's diet because he can gain weight fast, which causes him to breathe heavily. So, when trying Luvsome, I looked for their Indoor Formula cat food. My cats are both indoor cats and it's important to me that they get a well-balanced diet. It was recommended to mix some current food with the new brand of food, but I just happened to run out of their current food when the Luvsome coupons arrived in my BzzAgent kit. So, I gave both cats the Luvsome Indoor Formula cat food one morning on its own. Before I knew it, Theo was digging in and I mean eating like a mad-man. He definitely put into action the saying, "Now You See It, Now You Don't". He is definitely a fan! On the other hand, my 4 year old cat took a little longer, in the day, to try the new food. She did eventually come around and now eats it throughout her day. She's a slow-eater anyway though. I will mail you one of each (while supplies last) of the coupons I have below for free. I have cats so that's why I only have these. Send me a request on my Contact Me form HERE or above. Save $1.00 on the purchase of SEVEN (7) cans Luvsome Wet Cat Food, any variety. (Expires: September 01, 2014) -- Note: I am still trying to find this product in my Ralphs in Los Angeles, but it may be at the Kroger in your area. Let me know how your cat or dog enjoys Luvsome wet and dry foods in a comment below! P.S: Did you enjoy this BzzAgent Unboxing, if so, make sure to share it using the social media buttons below! Selena Thinking Out Loud With Purpose received a 'Thank you' pair of Broadway Nails called imPRESS Press-on manicure nails. I decided to wear them to see how they would check out. They last for 1 week, so give them a try if you're into these types of nails. Below is my YouTube video review for these particular nails. These nails can be found in your local drugstore, online, or in Walmart or Target. P.S: Did you enjoy this beauty manicure nails review? If so, make sure to share it using the social media buttons below.